SANTA RITA, Guam – A 2007 Bishop Dwenger High School graduate and Ft. Wayne, Indiana, native is serving with the U.S. Navy at U.S. Naval Hospital Guam. 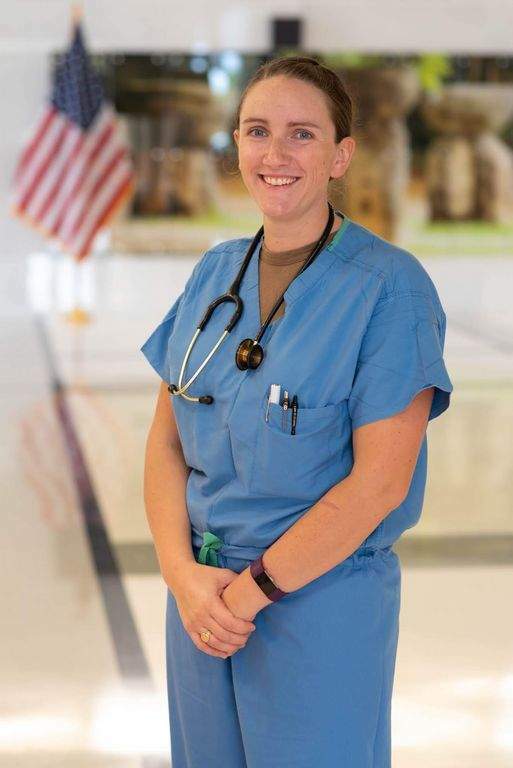 Lt. Erin Ryan is a nurse at the hospital and also serves as an assistant department head. “I enjoy taking care of patients and their families,” Ryan said. “I think it is important to make sure the warfighters can go fight and their families will be taken care of. I also like training the junior nurses, fostering that mindset that we are part of a mission that encompasses care and compassion." Ryan credits success in the Navy to many of the lessons learned while growing up in Ft. Wayne. Naval Hospital Guam is comprised of the main hospital in Agana Heights and two branch clinics, medical and dental, on Naval Base Guam. The hospital’s staff consists of 516 active duty and 201 civilians, contractors, reservists and volunteers who serve more than 26,000 beneficiaries. According to officials at the U.S. Navy’s Pacific Fleet headquarters in Pearl Harbor, Hawaii, the ships, submarines, aircraft and Navy personnel forward-deployed to Guam are part of the world’s largest fleet command and serve in a region critical to U.S. national security. The U.S. Pacific Fleet encompasses 100 million square miles, nearly half the Earth’s surface, from Antarctica to the Arctic Circle and from the West Coast of the United States into the Indian Ocean. All told, there are more than 200 ships and submarines, nearly 1,200 aircraft, and more than 130,000 uniformed and civilian personnel serving in the Pacific. Though there are many ways for sailors to earn distinction in their command, community, and career, Ryan is most proud that Naval Hospital Guam was recognized as being the Number One hospital in same-day access to care. As a member of one of the U.S. Navy’s most relied upon assets, Ryan and other sailors know they are part of a legacy that will last beyond their lifetimes, one that will provide a critical component of the Navy the nation needs. "People really look out for each other, everyone knows each other, and we are each other’s family here,” added Ryan.